This article originally appeared on Inverse. At a press event for the release of Marvel's Ant-Man this week in China, Marvel Studio executives Jeffrey Reingold and Stephen Wacker revealed that they hope to appeal to the growing Chinese market by introducing new Chinese superheroes into all of Marvel media, from comic books to film. It's a bit of playing telephone, but in a Xinhua News report translated by the GB Times, Jeffrey Reingold said Marvel has "felt the passion of Chinese fans." "As long as there is a demand in the market, it is possible to add Chinese elements and culture to Marvel products and create Chinese heroes and stories," Reingold said. There's certainly a demand. Marvel movies have done extremely well overseas and China is one of the biggest markets for Hollywood today. This year's Avengers: Age of Ultron topped $200 million in China, and Ant-Man crushed with a $42.4 million opening. Stephen Wacker said that Marvel is researching and preparing for the new characters. According to the Google Translated of the Xinhua News article, Marvel wishes "not to be too hasty" with its endeavor. "Forty years ago, all of our readers were Americans, and therefore only [we had] to face the U.S. market and the U.S. audience," Wacker reportedly said at the press event. Catering to China is relatively new territory, full of unique cultural nuances they may not be immediately aware of. It's smart to take their time. Marvel has introduced several new Asian-American superheroes in the very recent past, such as Silk and Amadeus Cho as the new Hulk. But Asian superheroes are still absent, and even fewer are Chinese. 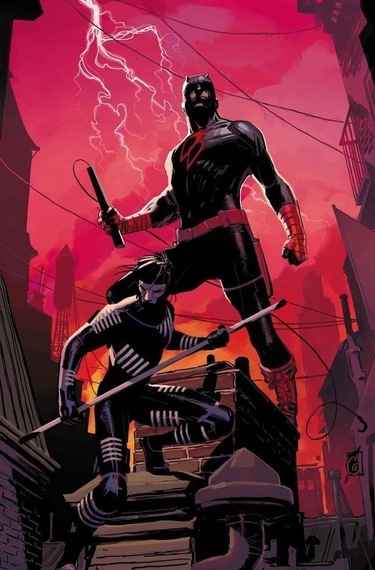 In the "All New, All Different" Daredevil #1 coming out in December, the superhero will train a new ally, Samuel Chung, a Chinese illegal immigrant who patrols New York City's Chinatown. Could Marvel be hinting it's changing the ethnicity of Danny Rand, a.k.a. Iron Fist? Or will they perhaps introduce a new character to take up the Iron Fist mantle? Iron Fist has been the subject of curiosity lately, as the Netflix-exclusive series has been rumored to have been cancelled due to Marvel's blurry vision for the project. Based on Marvel's kung-fu superhero, the proposed series has attracted debates across the web regarding the character's ethnicity, who is white. What to Know About Lash, the New Terror in Agents of S.H.I.E.L.D.